Whether you’ve survived your first New Hampshire winter or your 31st, you’re going to want to celebrate the spring season by getting outdoors as much as possible. What better way to enjoy the renewal of the Earth than to hit the trails running? If you are already an accomplished runner, the transition to trails shouldn’t be too difficult, but it does take a different approach. You are far more likely to trip over a root if you aren’t paying attention, especially if you are taking in the scenery, and you’re at greater risk for rolling an ankle. You can expect it to take a little longer to run the same distance you would on a road because the softer surface of the trail slows you down. But the benefits exceed the negatives, as trails tend to be more forgiving on the joints, and you don’t have to negotiate traffic — usually only other runners, hikers or mountain bikers. Measuring in at 58 miles, the Northern Rail Trail spans Grafton and Merrimack counties and is the longest rail trail in New Hampshire, and it’s beloved by cyclists and runners alike. If you are new to running entirely, trails are a great way to start out. You can break up your run into walking/jogging intervals and when you find yourself walking, you can truly enjoy your surroundings. New Hampshire is home to countless trails, from hilly to rocky to single-track to paved and, blessedly, flat rail trails. All there is left is to choose the path that’s right for you. You could definitely get by with a standard street running shoe on the trails, but for the best grip and overall experience, a pair of trail runners is a great investment. The Brooks Cascadia 10 ($78) gets high marks for its durability on even the most rugged trails. April weather in New Hampshire is unpredictable at best. Having a lightweight, packable jacket that can protect you from the changing elements is ideal, and the North Face Feather Lite Storm Blocker Jacket ($200) does just that. .
It’s good to carry plenty of water with you on your trail runs, but not having to fuss with water bottles while navigating uneven terrain is even better. The Osprey Rev 1.5 Hydration Pack ($70, pictured at right) keeps you hands-free while providing you with 51 ounces of H2O. This low-profile pack keeps the weight close to your body for less bounce, and the mesh back is highly breathable, keeping you cooler. Plenty of pockets for stashing energy snacks and other essentials. Ron Abramson has had a career in immigration law spanning 22 years. He regularly runs with disabled runners through Team with a Vision and Achilles International, serving as a sighted guide at the Boston Marathon, the National Blind Championships at the Woodrow Wilson Bridge Half-Marathon, the Bay State Marathon and the Ragnar Cape Cod Relay. He calls Bow, NH, his home, where he lives with his wife Meredith and four children. How did your love for running first start? I was an avid soccer player who sustained an injury and needed to channel my desire for regular physical activity into something else. I was invited to run a half-marathon in 2006, which seemed really far, and have been hooked ever since. Living near so many trail networks, it was natural to get out and run on them, especially as I befriended more and more trail and ultra-runners. I’d always enjoyed hiking, so covering that same terrain a bit faster was basically more of a good thing for me. A complete list of trails in New Hampshire and how to access them. Southern New Hampshire’s site for runners who like to hit the trails with others. 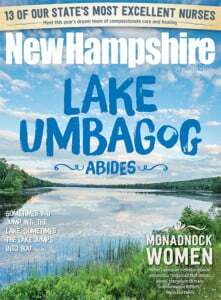 For trail runners in the White Mountains region, this magazine-style site features stories and race details from way up north. What does a typical week of running look like for you? Depends. I’ve averaged over 70 miles per week when really training, but that has yielded to other life demands lately (thanks to a new baby and a growing law practice). I’m running closer to 30 miles per week, what I like to think of maintenance mileage. Given the choice, I’m a lunchtime runner, but will do early mornings and evenings if that’s the only option on any given day. If you could be dropped anywhere in NH and have any weather conditions you chose, what trail would you be running? Hard to beat fall running on any trail with a mountain and/or water view. Two, three, four smooth, steady hours of running is bliss. What is your biggest struggle to get in your miles? Lack of sleep, which leads to missed runs, which leads to lost fitness, which makes the remaining runs less enjoyable. It’s a vicious circle sometimes, but I try to remind myself that I will always regret skipping a run, but never, ever regret going for a run. Best trail racing (or just training run) experience you can share. Running has given me so much, it’s hard to narrow it down. My most memorable moments tend to be either when I find peace in solitude or when I connect with other runners in a way that most social interaction simply doesn’t seem to allow. Helping physically disabled and blind/visually-impaired runners achieve their goals is the most satisfying and enjoyable thing I’ve done outside of work and family.